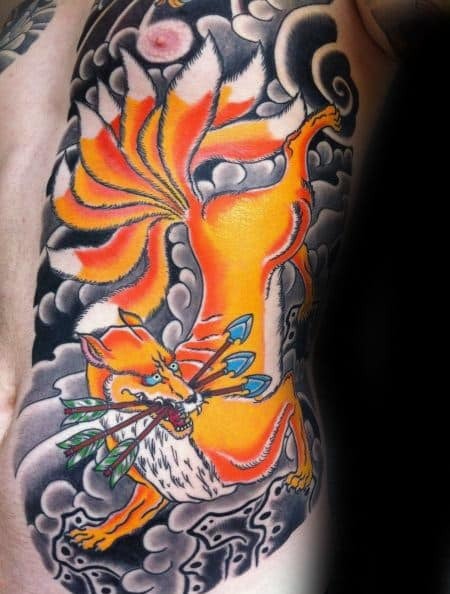 Kitsune are iconic entities from Japanese lore that exist as wise foxes with shape-shifting abilities. 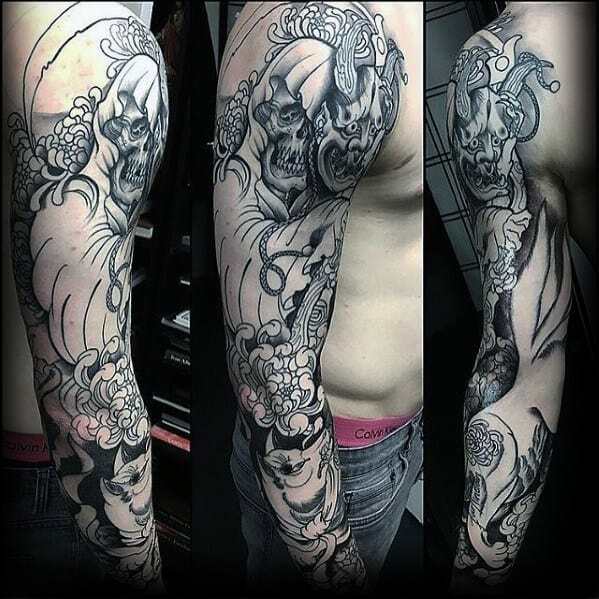 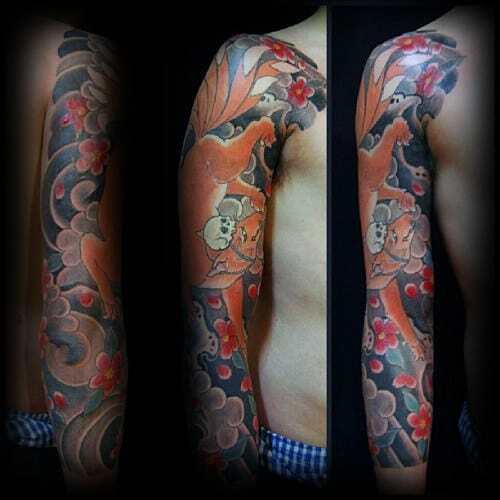 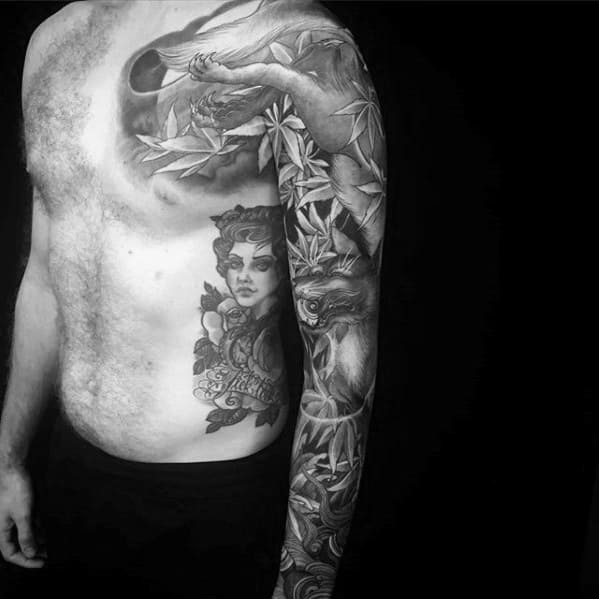 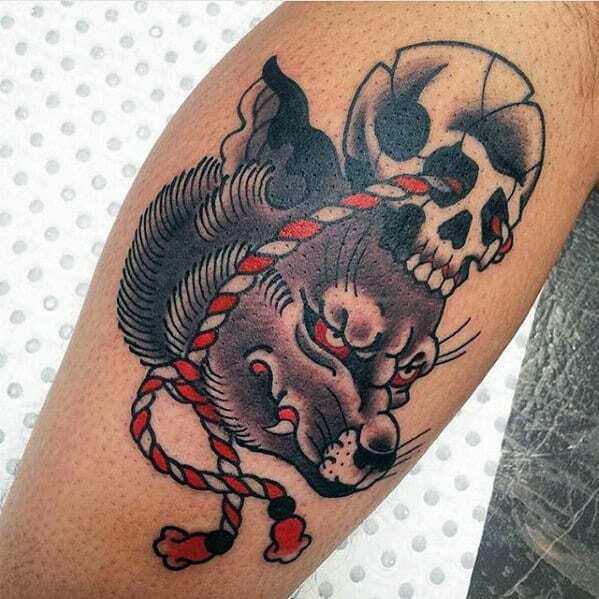 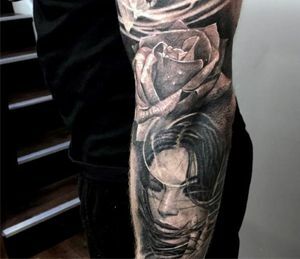 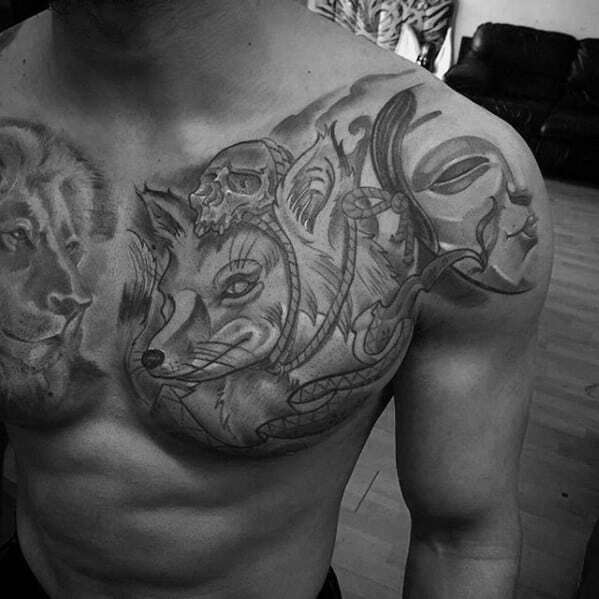 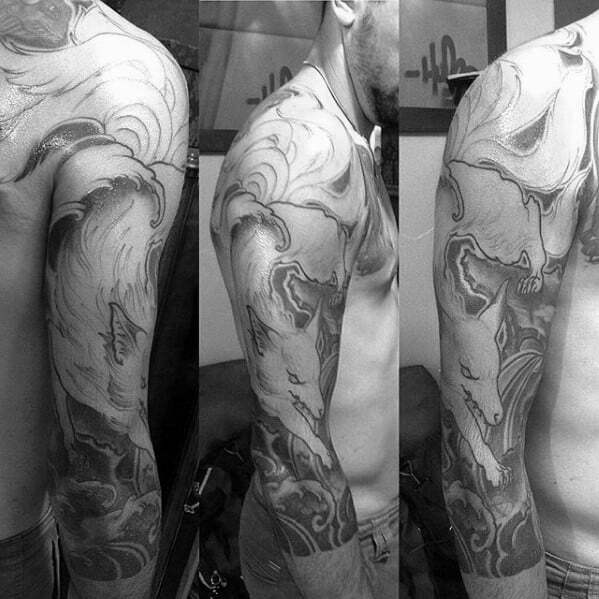 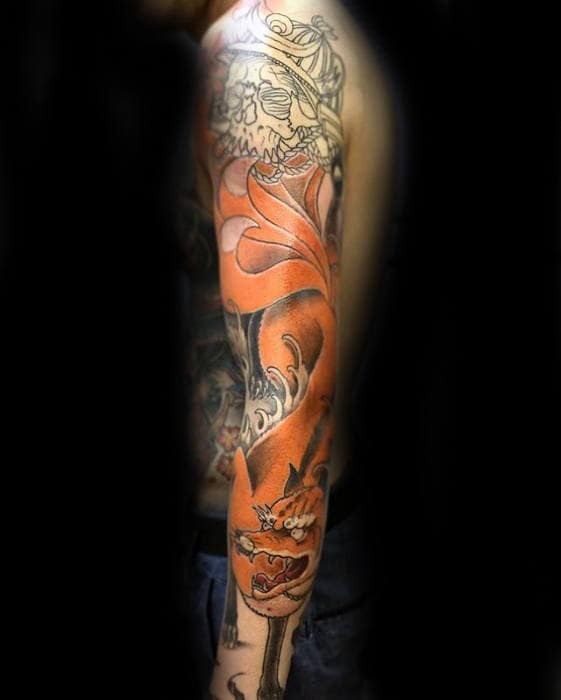 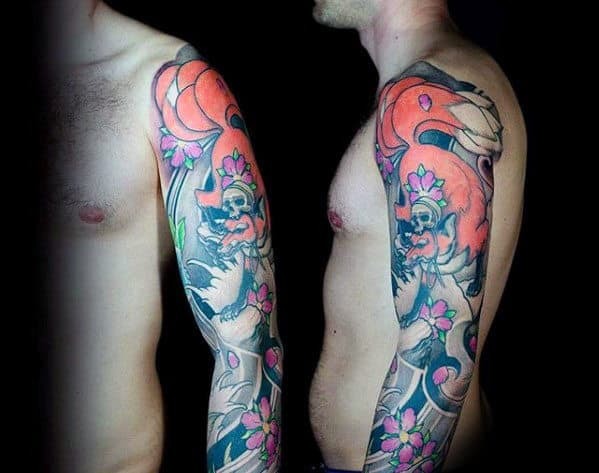 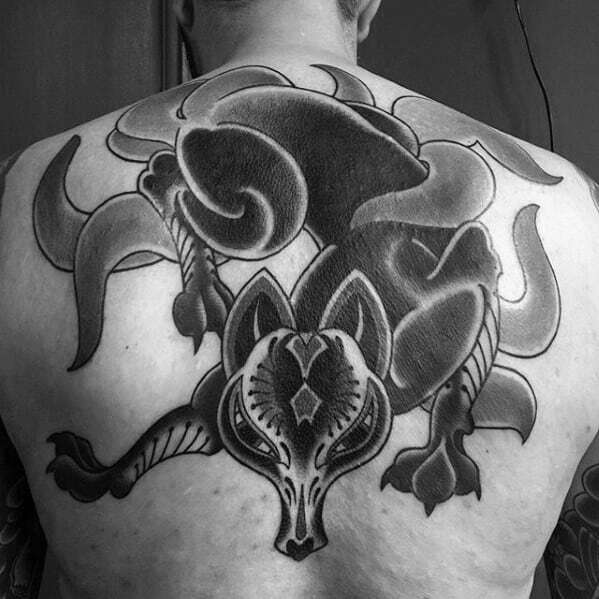 Tattoos that feature these enigmatic and bold creatures are said to represent both trickery and friendship. 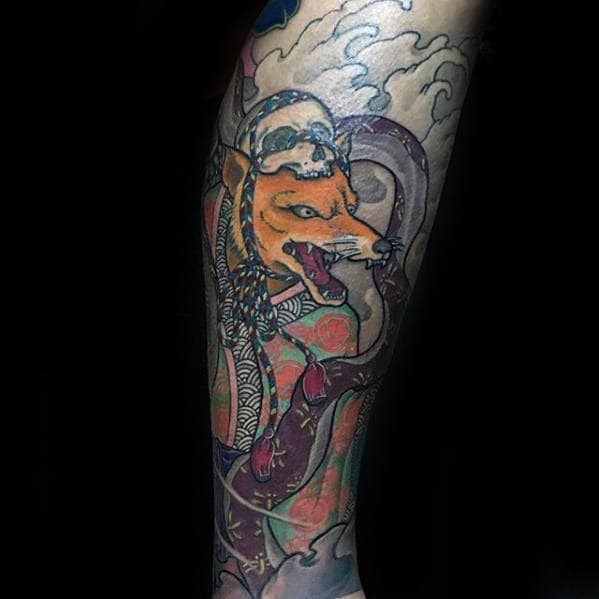 Beyond Japanese mythology, foxes are well-versed in their connection to folklore and legends from many different backgrounds. 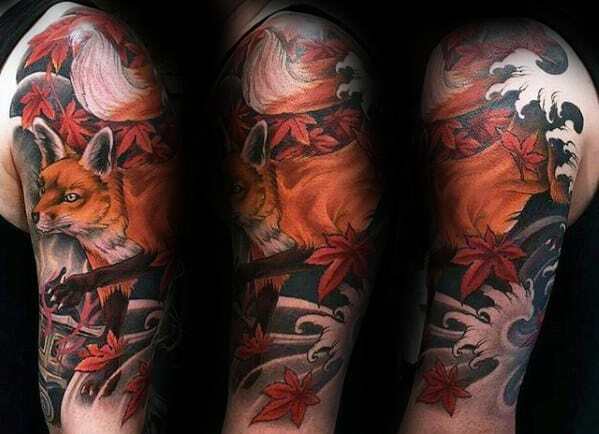 Kitsune literally translates to fox in English, but the term is much more descriptive of the illusive and magical nature of these forest-dwelling creatures. 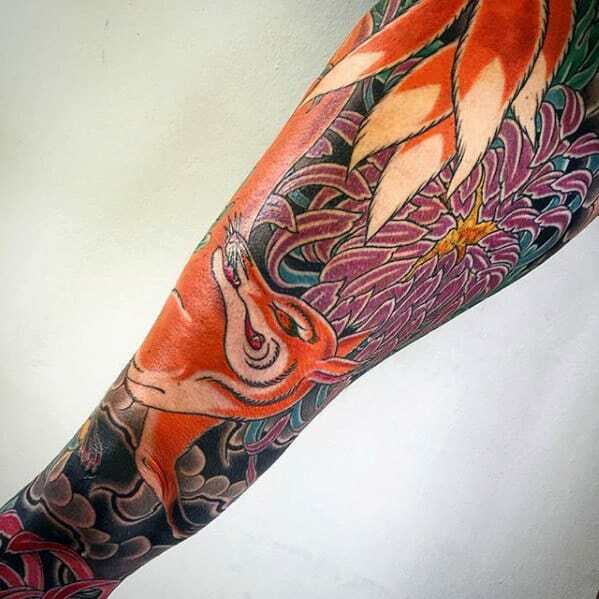 The tail of the Kitsune is said to reflect the magic within the animal, and those with many tails are said to be far wiser than those with a single tail. 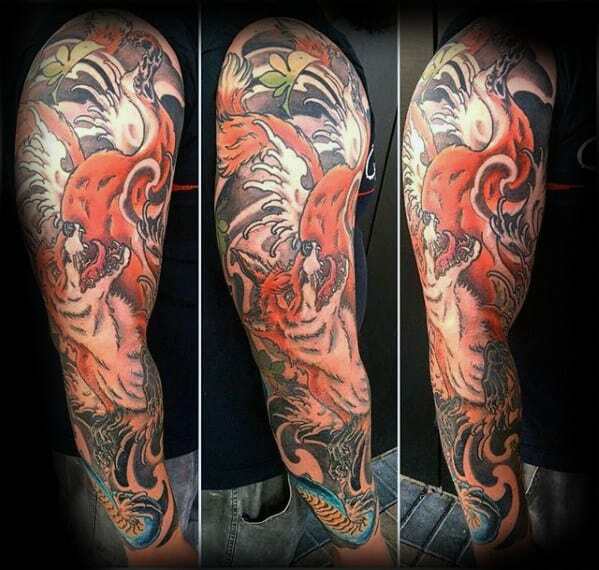 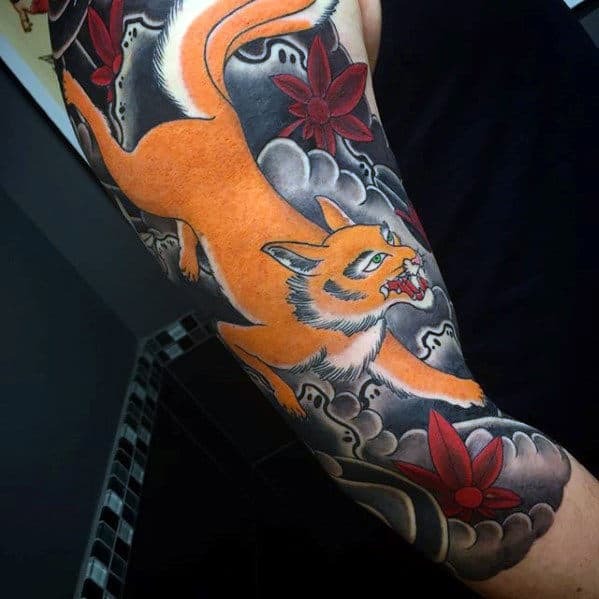 Kitsune are commonly represented with up to nine tails, and their Japanese-themed imagery is distinctly beautiful and unique. 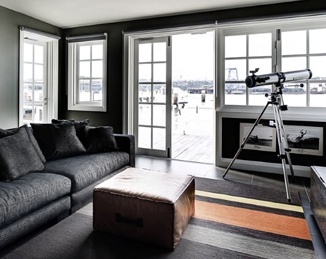 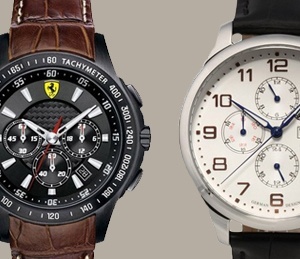 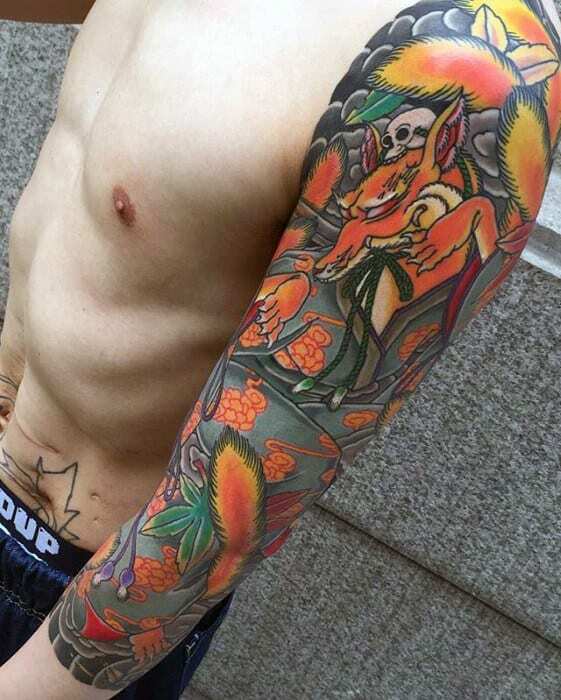 The brilliant color schemes and sharp, abstract styling is both aesthetically pleasing and highly detailed. 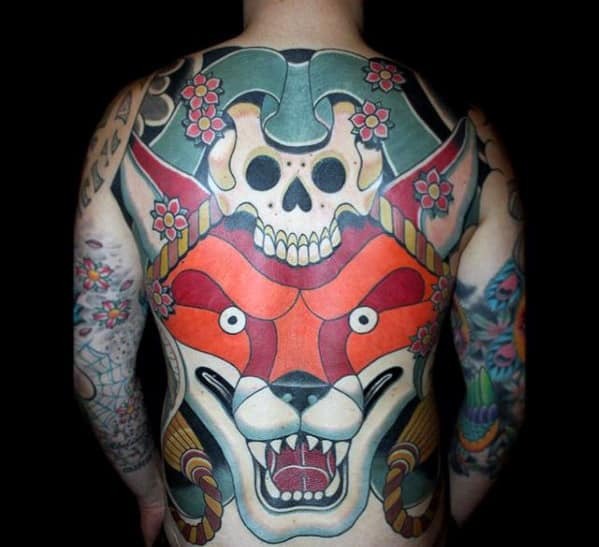 Many Kitsune are depicted with a skull attached to the top of their head like a hat, which is more indicative of the trickster nature within the shape-shifters. 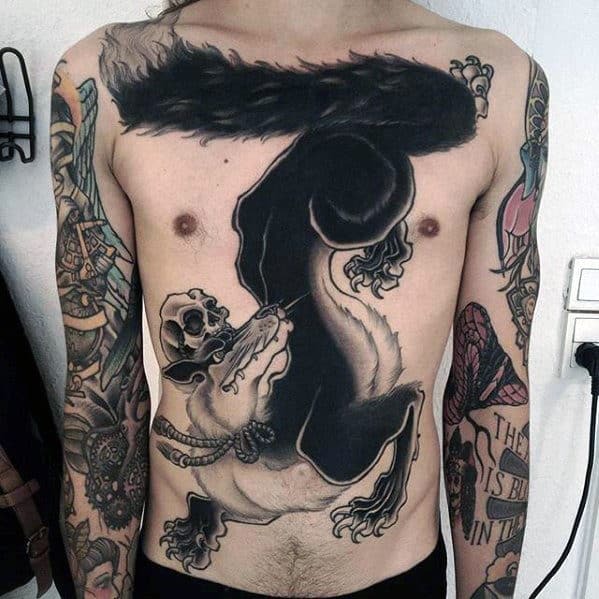 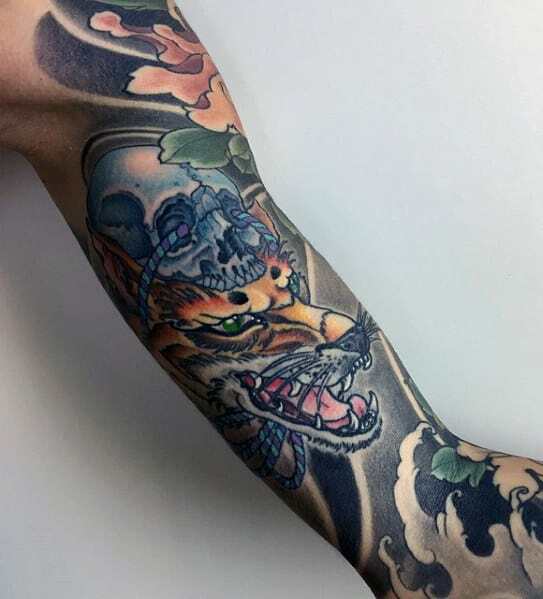 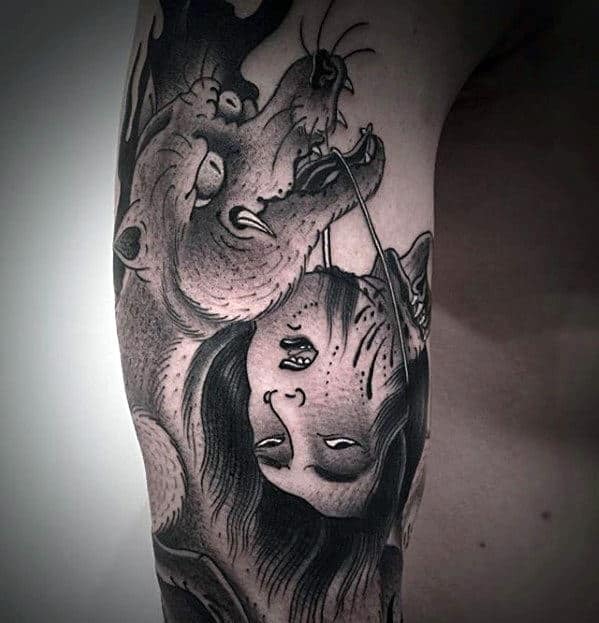 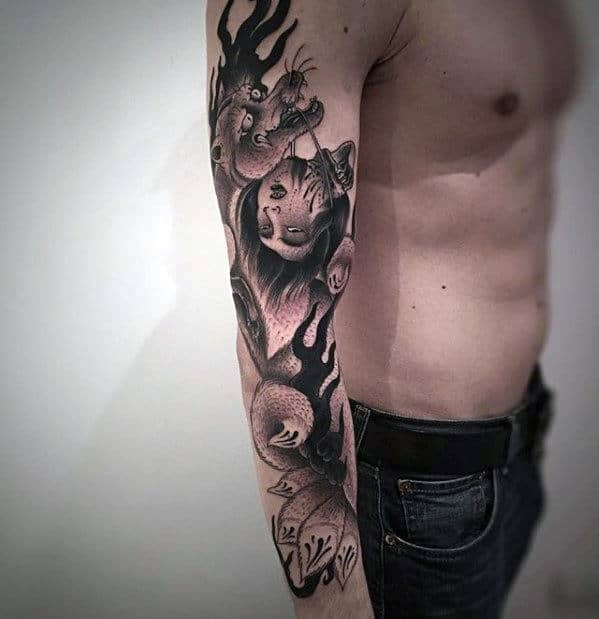 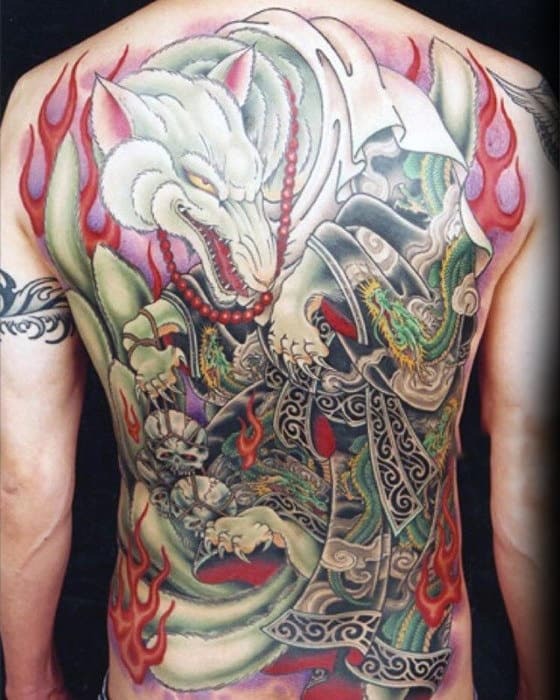 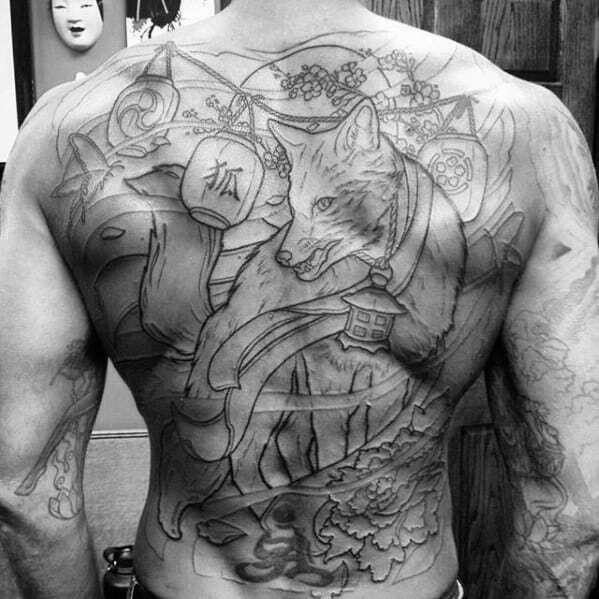 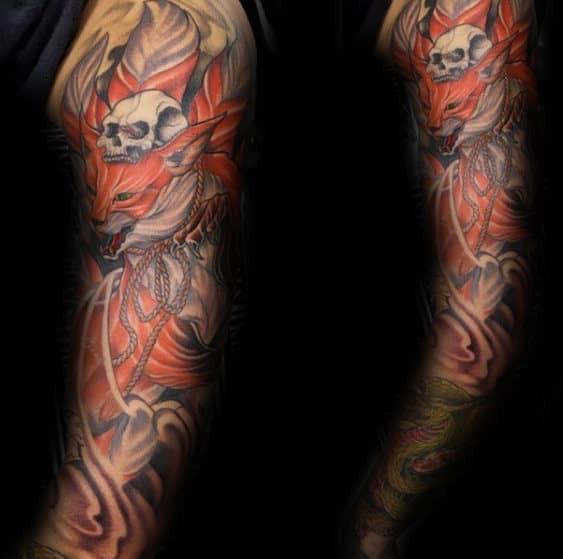 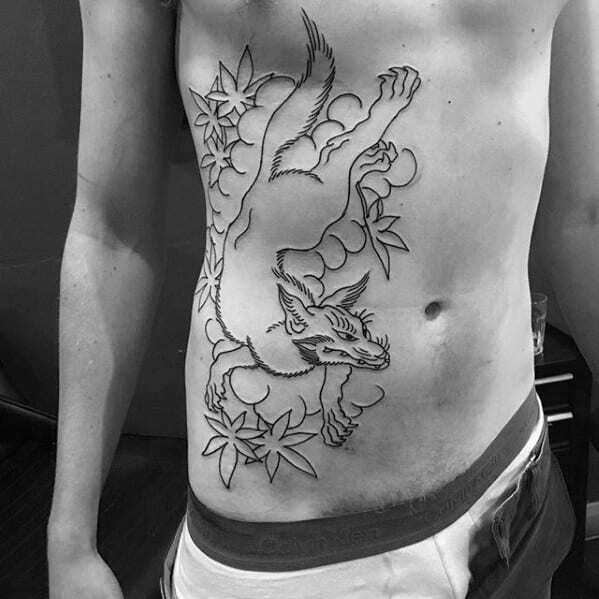 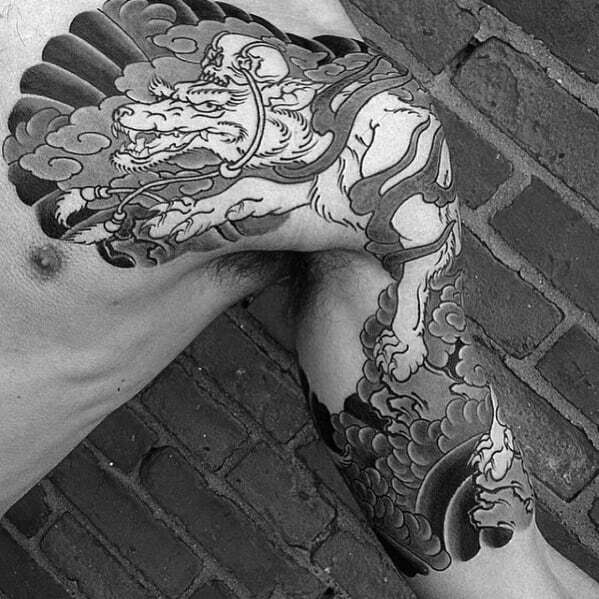 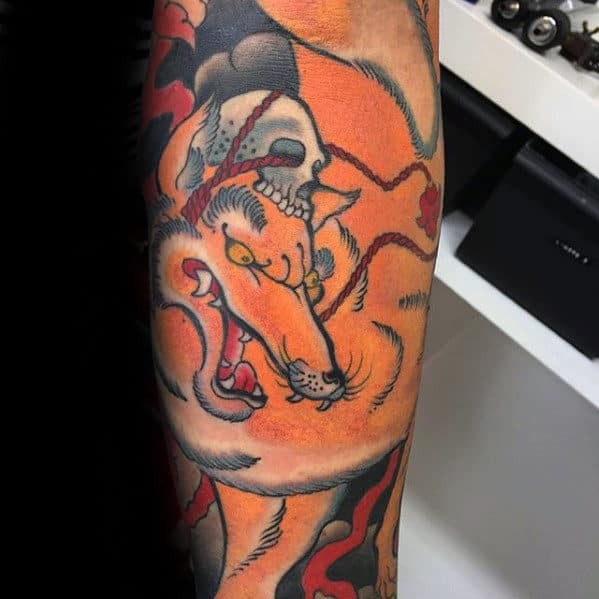 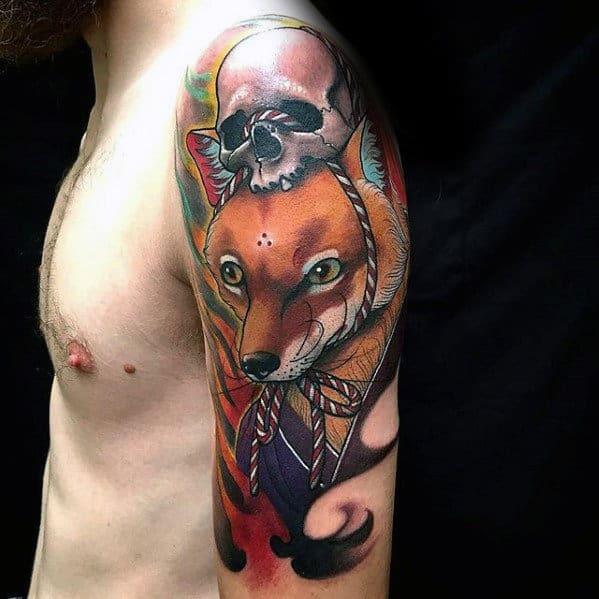 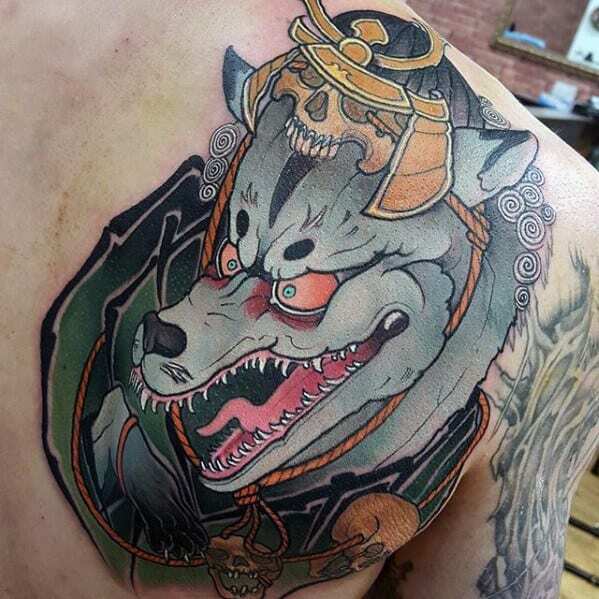 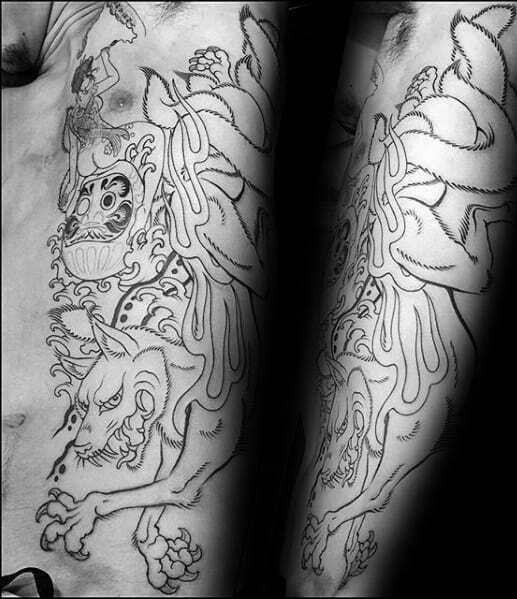 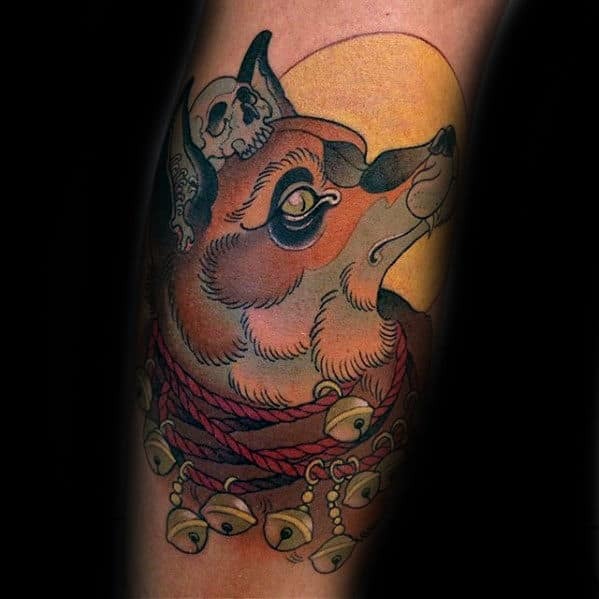 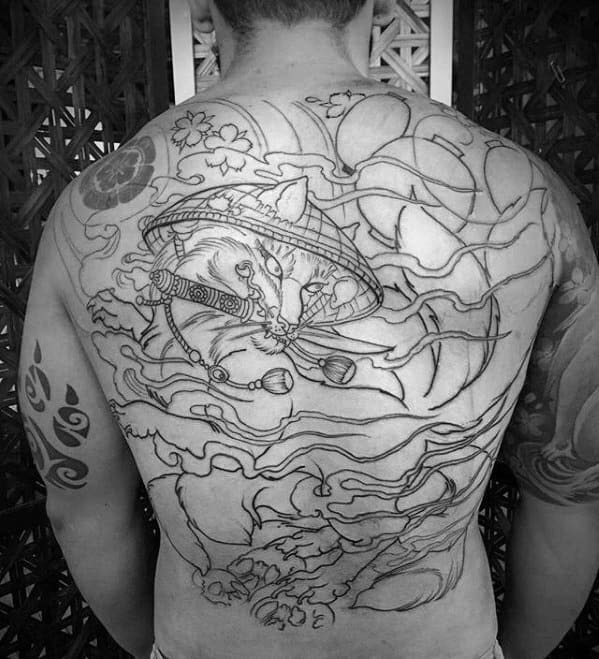 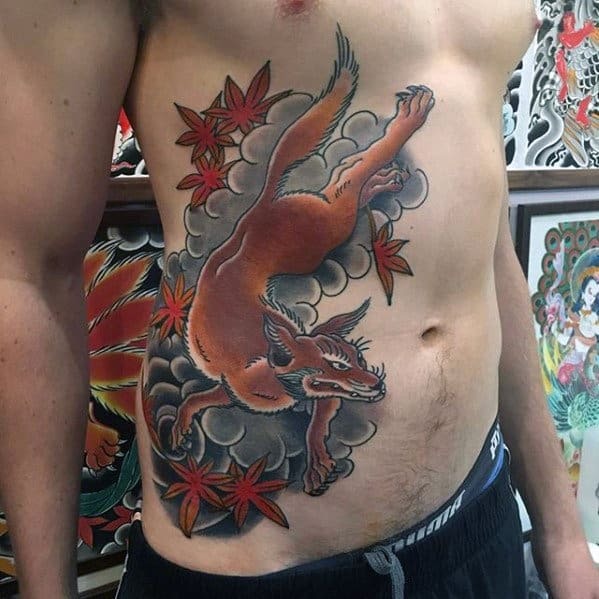 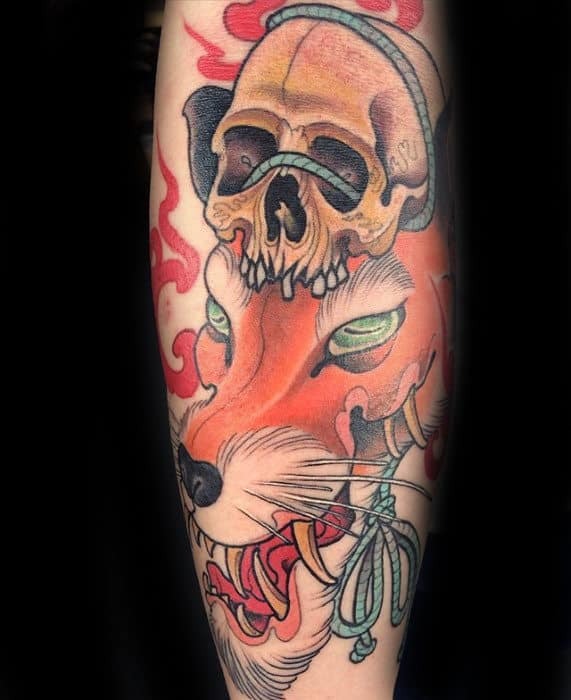 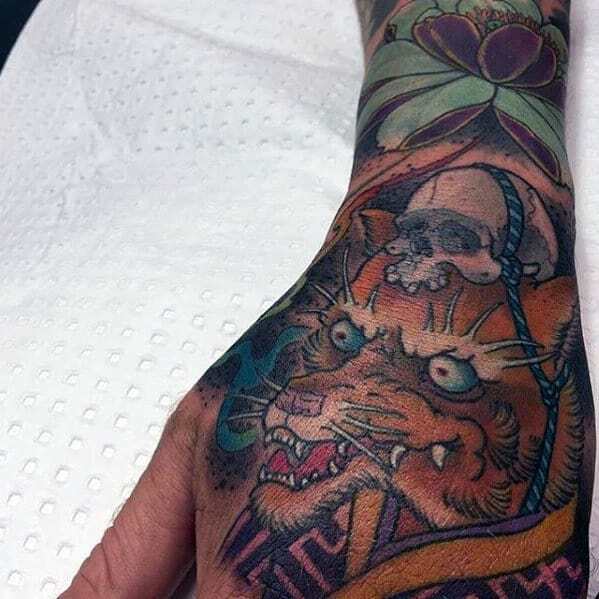 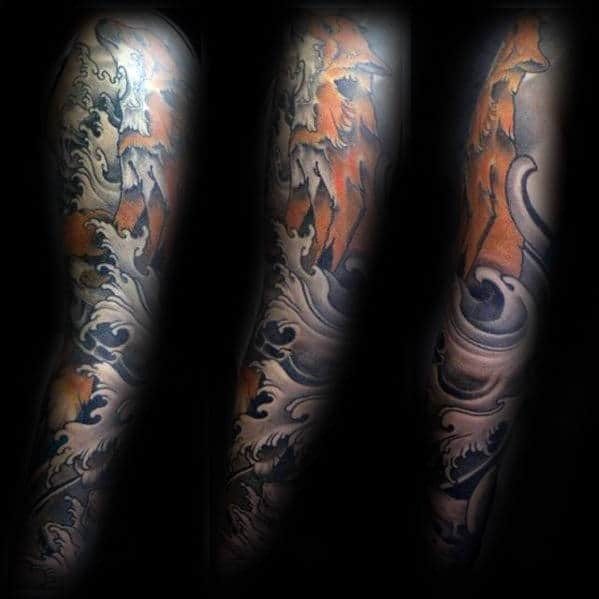 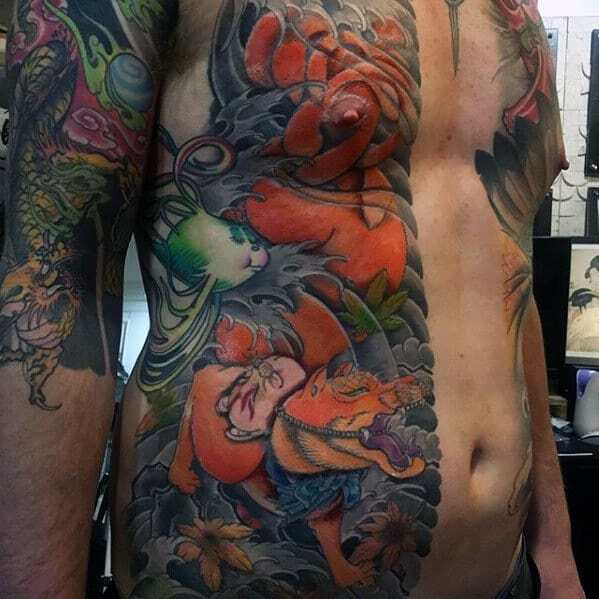 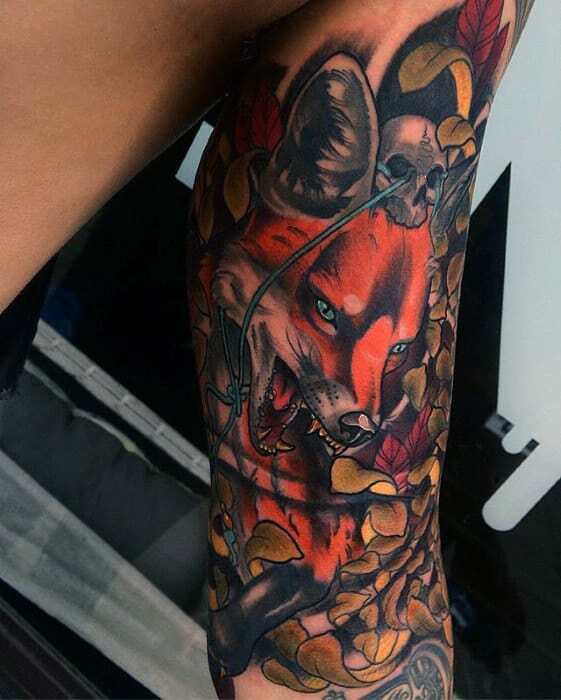 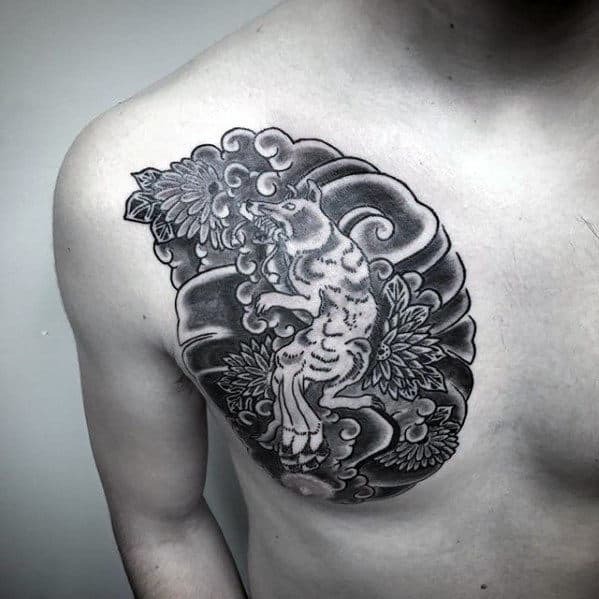 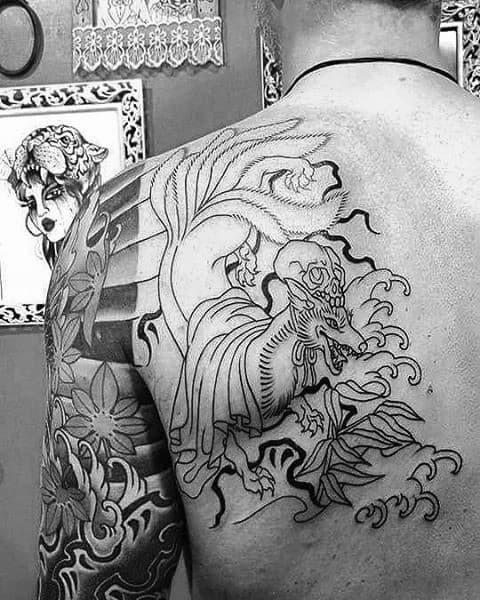 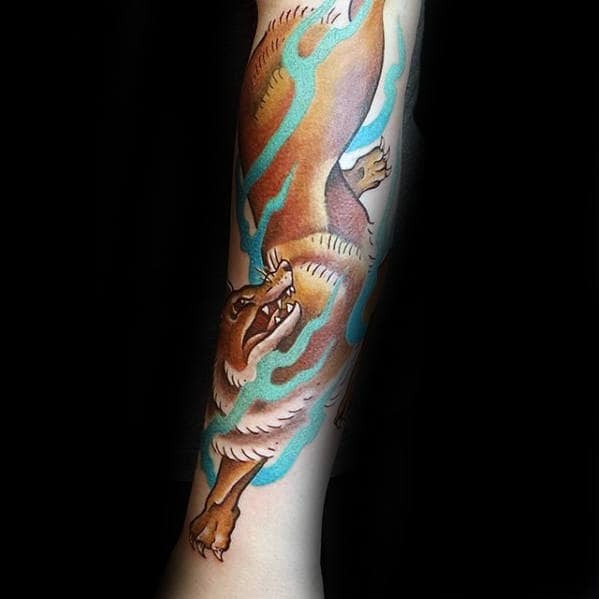 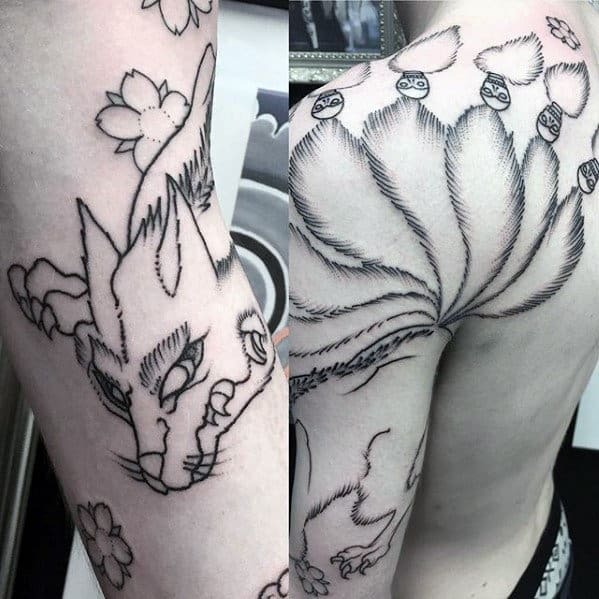 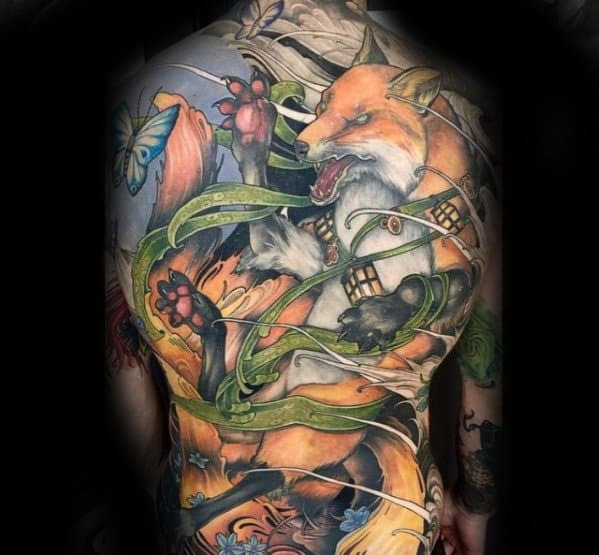 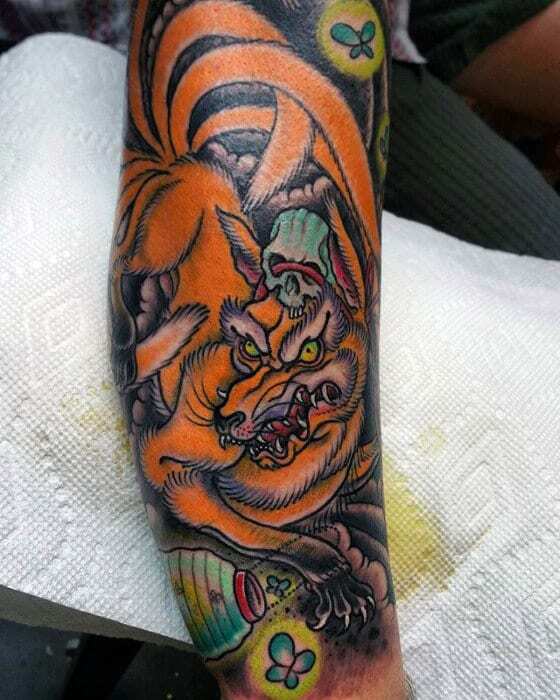 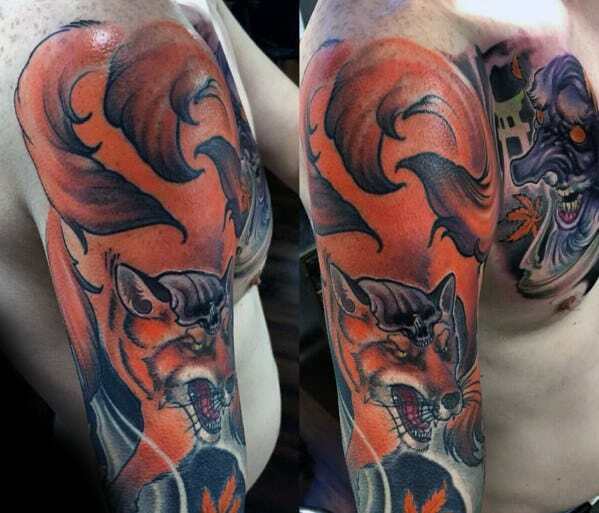 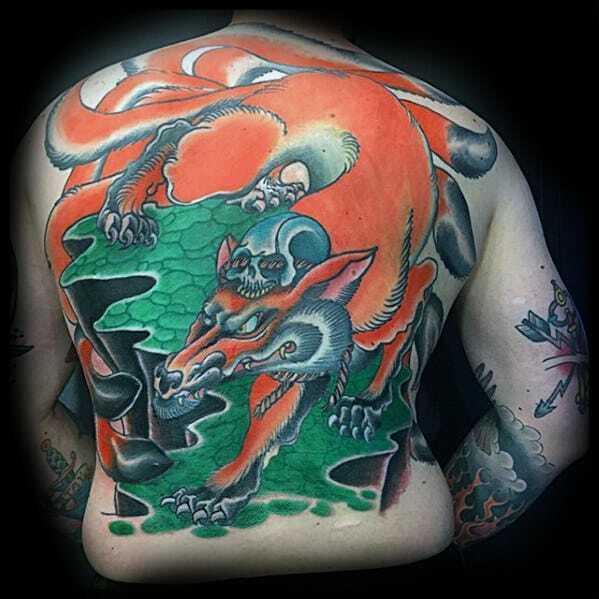 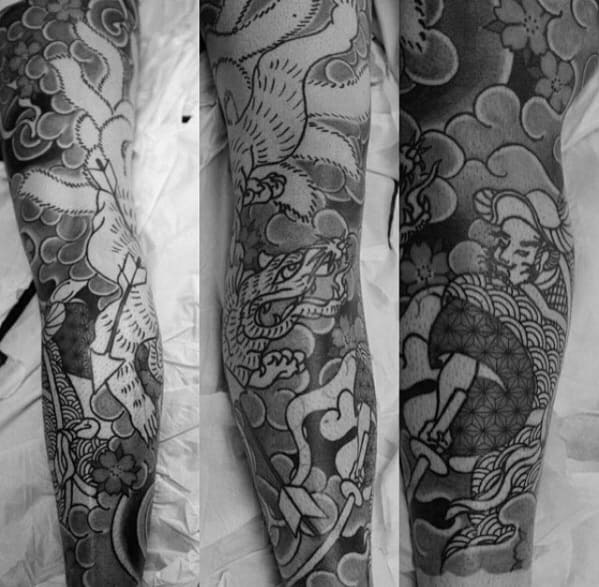 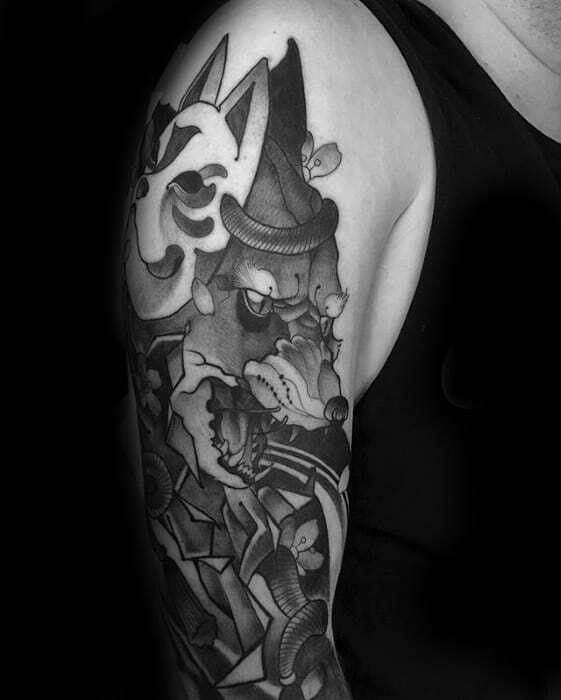 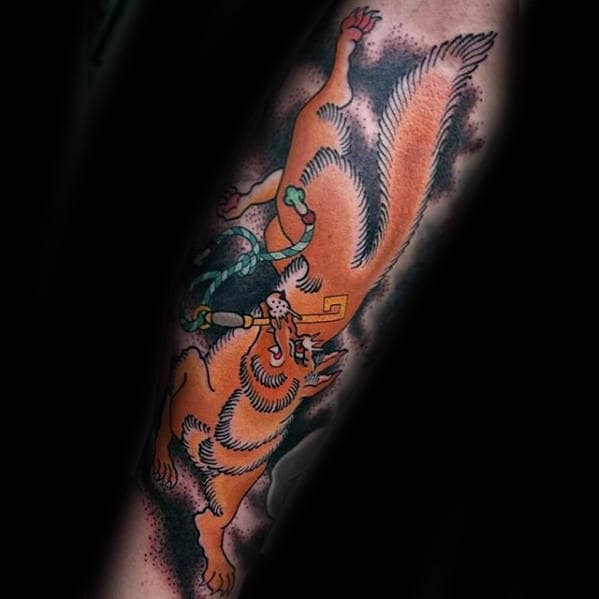 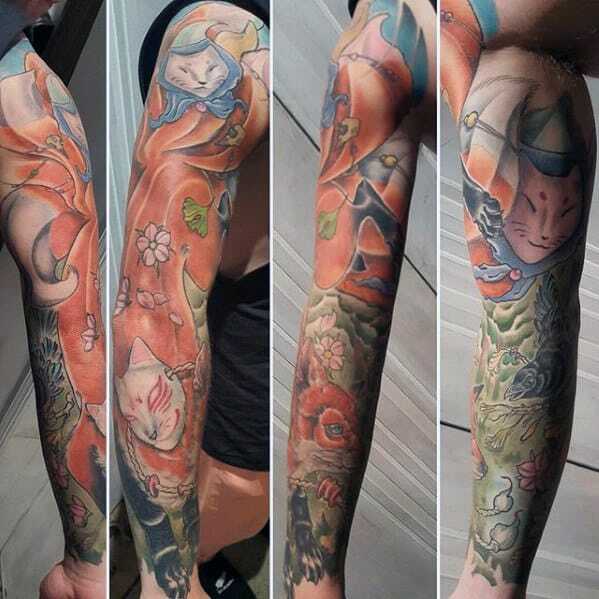 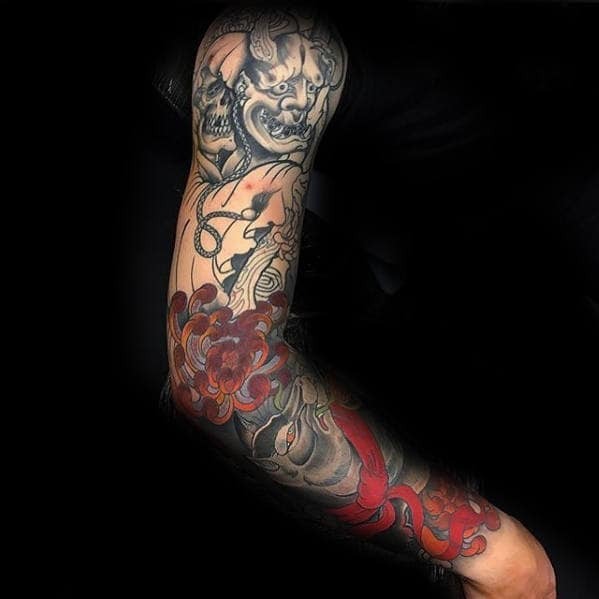 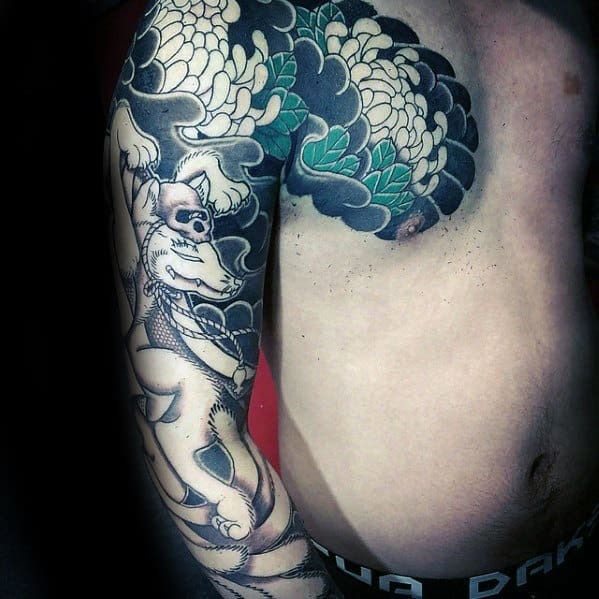 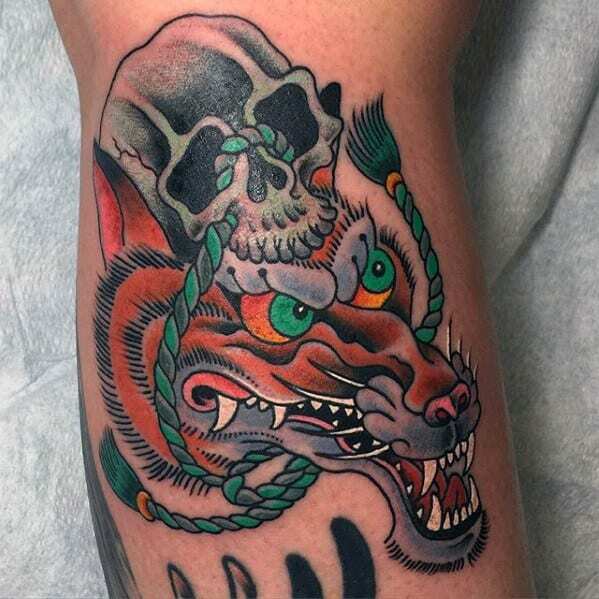 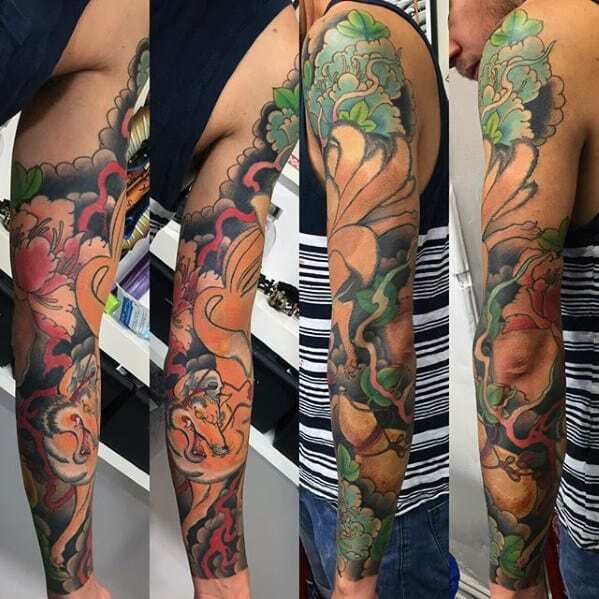 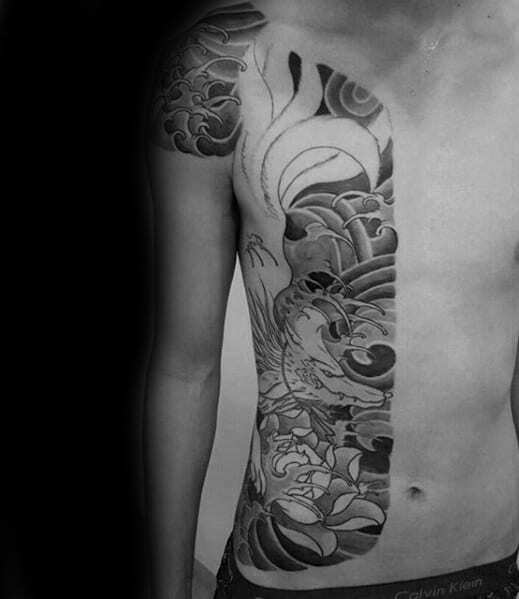 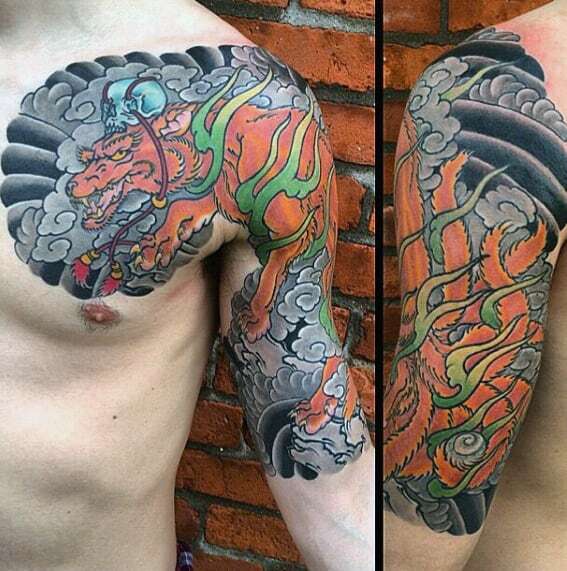 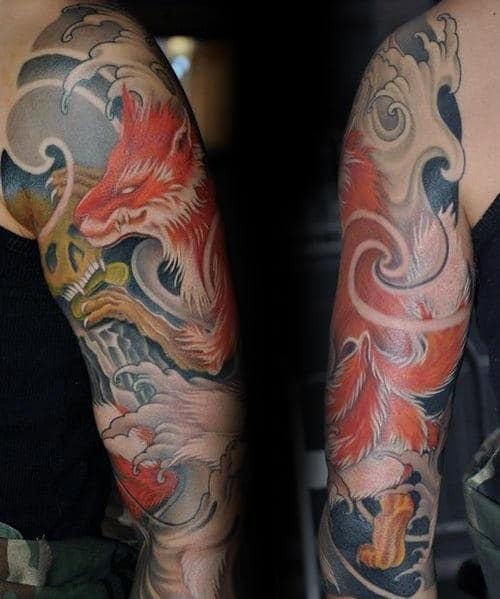 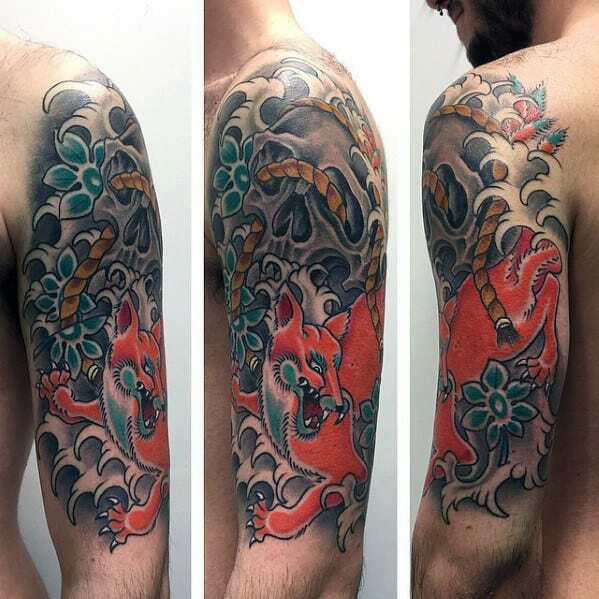 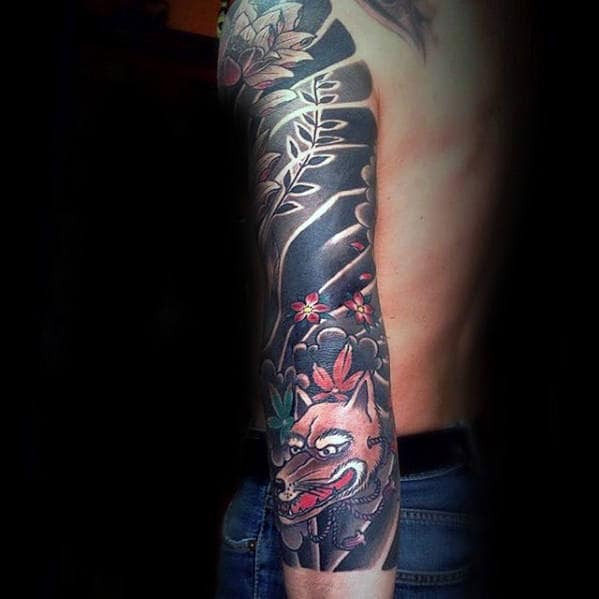 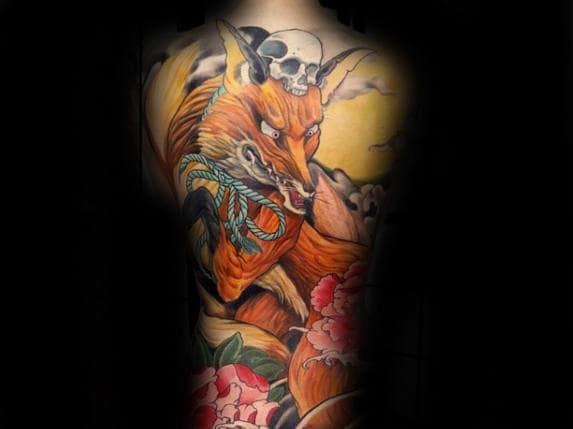 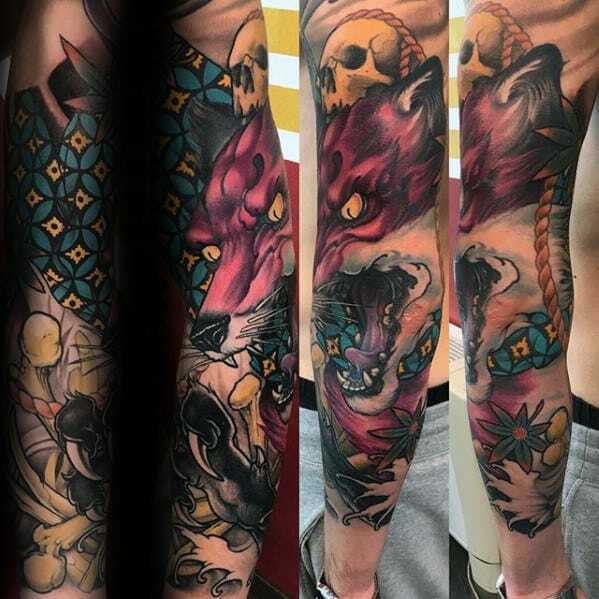 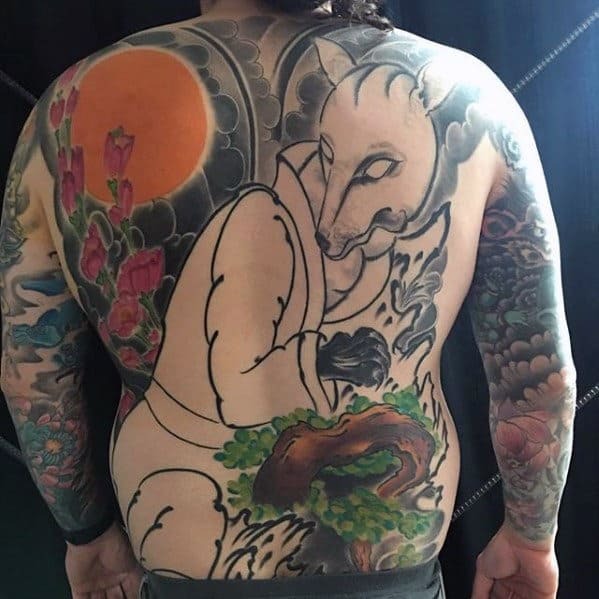 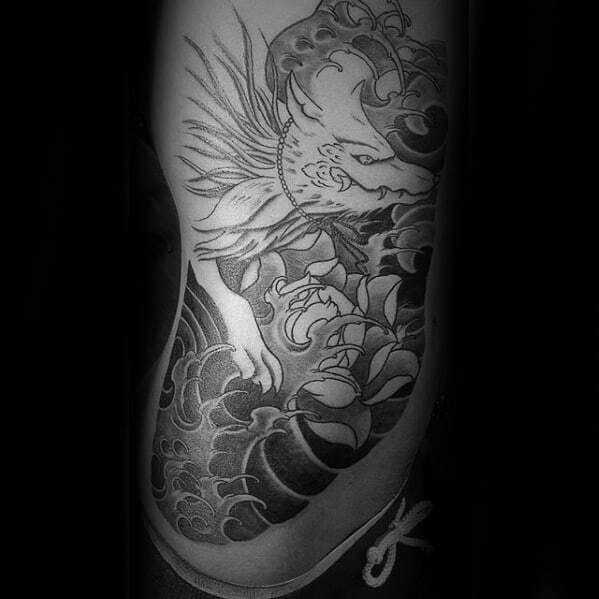 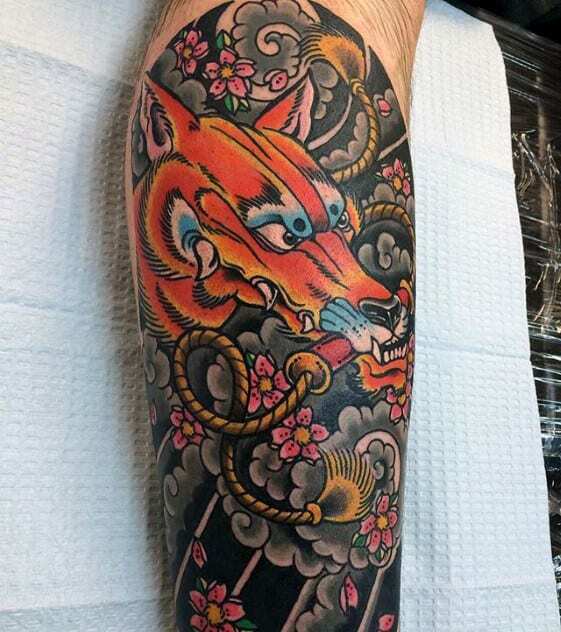 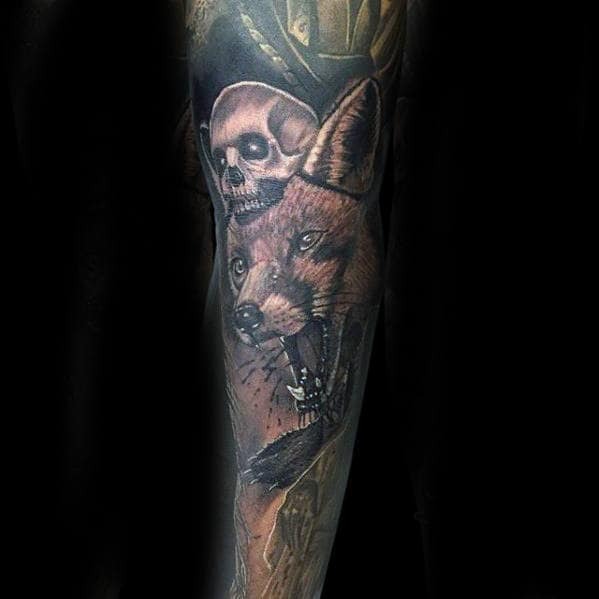 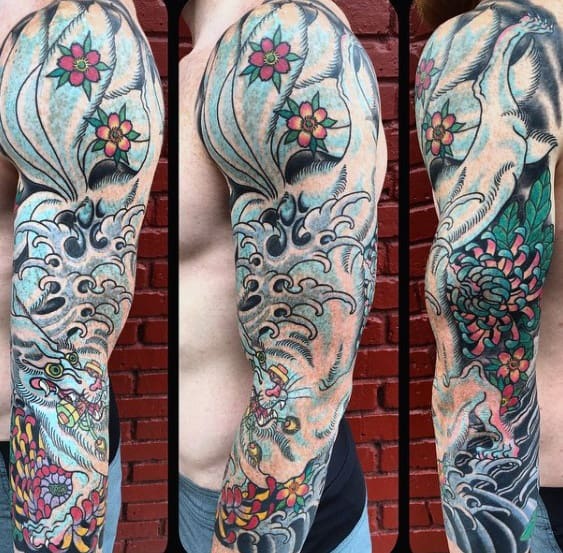 The symbolism behind a Kitsune tattoo has many potential interpretations that are each unique to the wearer. 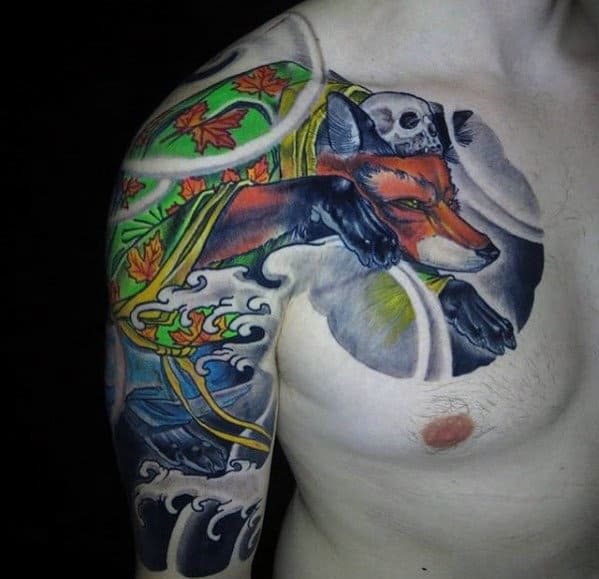 It can be either good or villainous, but the overall nature of the image is about wisdom, strength, and magic. 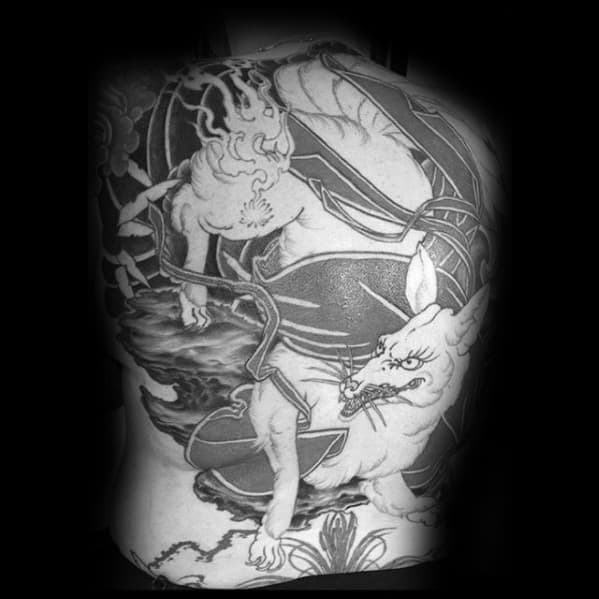 These creatures can bring both good luck and horrible misfortune, so their duality is popular amongst those who respect that reality is never one-sided.